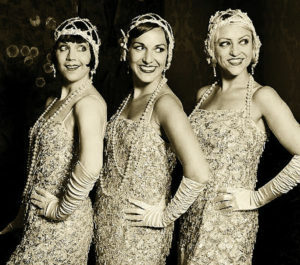 Editor’s Note: While the rest of Sandpoint dives into the 1950s this weekend, Reader contributor Tim Henney explores another decade: the Roaring ‘20s. Movies and memoirs say America’s hedonistic, swingin’ culture was spawned in the ‘60s by Dylan, Baez, Janis Joplin and The Beatles. Not so. America’s modern mojo was born in the roaring ‘20s. The decade of whoopdeedo was quelled by the Great Depression, but until it collapsed, the decade was exhilaration on steroids. Prohibition started in 1920. And that did it. Weary from Victorian inhibitions and World War I, and highly pissed about having to sneak their booze, Americans cut loose. The euphoria died, worked its way back in the ‘60s and ‘70s, and remains with us today — but tamped down and in camouflage. Radio, movies that talked, speakeasies, bootlegged gin and bad guys like Al Capone. Time, Life, Harper’s Bazaar, Vanity Fair and The New Yorker. Bohemian Greenwich Village, where free love blossomed. Religious fundamentalism. Skinny flappers dancing “The Charleston.” Boyfriends with flasks and ukuleles singing “Yes, Sir, That’s My Baby” and “Ain’t We Got Fun.” Young women shedding puritan morals, showing their knees, smoking in public. Saying “Oh, hell’s bells!” The Lost Generation on the prowl (and Adolf Hitler, from a German prison in 1925/26, writing “Mein Kampf,” his plan for world conquest). Authors F. Scott Fitzgerald and Sinclair Lewis and artist John Held Jr. portrayed the decade as happy decadence. Dancing, drinking, back-slapping rotary club boosterism, rushing around in raccoon coats from one college football game and frat party to another. It was a heady celebration — providing one was among the connected, the comfortable, the young and anxious. What is often ignored is that violent, hooded rustics of the Ku Klux Klan (among today’s fervent Trump base) lynched blacks with impunity. But segregation was routine not just down in Dixie. Bloody race riots erupted up north. Prohibition brought the Mafia. Deadly union/management battles scarred textile, timber, mining, automobile and other burgeoning industries. President Warren Harding’s infidelities and his buddies’ Teapot Dome Scandal plagued government. With few watchdogs, big business corruption was rampant. Worse, even, than today’s scheming banking, pharmaceutical and tobacco companies, and makers of sugar-laden colas. In the rural Scopes Monkey Trial celebrity lawyers William Jennings Bryan and Clarence Darrow debated if evolution was fact or fiction. Seeking work, millions moved from farms and cotton fields to urban centers, creating slums. Land developers in Florida fleeced naïve buyers. Police brutality was common – unless the prisoners were wealthy (Harry F. Sinclair, worth over $50 million in 1929 dollars, went to jail for jury tampering, contempt of Congress and other misjudgments that would have put a lessor citizen away for life. Harry turned part of the prison hospital into a Sinclair Oil Company boardroom, dined nightly on filet mignon, and was assigned a dozen prisoner servants. Harry owned a passel of politicians and judges). Authors, editors and poets of the Jazz Age included Eugene O’Neil, Edna St. Vincent Millay, John Dos Passos, Ernest Hemingway, F. Scott Fitzgerald, Sinclair Lewis, Edith Wharton, Thomas Wolfe, Gertrude Stein, Sherwood Anderson, William Faulkner, H. L. Mencken, Dorothy Parker, Damon Runyon, E.B. White, James Thurber, Edna Ferber. Duke Ellington, Eddie Cantor, Al Jolson, Walter Winchell, Mary Pickford, Douglas Fairbanks, Cecil B. DeMille, Mae West, Louis Armstrong, Paul Whiteman, Georgia O’Keeffe, Cole Porter, Emily Post, Fiorello LaGuardia, young Bing Crosby of Spokane and his Rhythm Boys. Among legendary Jazz Age jocks were Babe Ruth and Lou Gehrig of the Yankees, golf’s Bobby Jones, football’s “galloping ghost” Red Grange, Big Bill Tilden of tennis, boxing’s Jack Dempsey and Gene Tunney, swimming’s Gertrude Ederle and Johnny Weissmuller (Tarzan in the movies when I was a lad), dancer Martha Graham, coach Knute Rockne of Notre Dame and his backfield, named “The Four Horsemen” by sportswriter Grantland Rice. For flair and flamboyance no decade has come close. Compared to the rebellious, racially intolerant, rip snortin’ and roaring ‘20s, the years since have been more like a whisper. And that’s probably just as well.